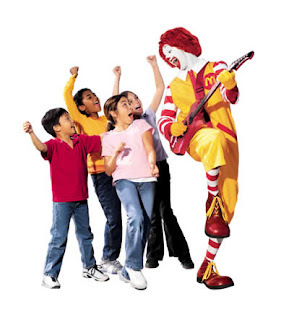 Why so happy Ronald? And why aren't those kids overweight? According to a report released by the Center for Science in the Public Interest (CSPI), 90% of kid's meals at fast-food restaurants exceed the recommended amount of calories a child should be consuming. This may be one of the key factors to child obesity. Margo Wootan, CSPI nutrition policy director said, "people may not get a heart attack until their 50's or 60's, but arteries begin to clog in childhood. Most of these kid's meals appear to be designed to put America's children on the fast track to obesity, disability, heart attack or diabetes." The average child should have no more than 1,200 - 1,300 calories per day. Data from a study involving 13 fast-food chains, found 93% of 1,474 possible food selections contained an entire days worth of calories in one meal. I think parents are well aware that fast-food is an unhealthy meal choice, regardless, it's convenient and easy pleasing (at least for your kid), so nutrition must sometimes be sacrificed. This is something that is obviously understandable - after all, parents have the hardest job in the world, (unless you happen to be a professional bear wrangler). 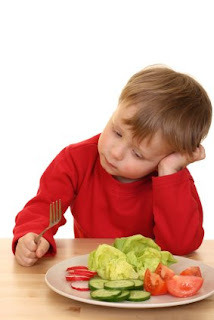 It should be in the restaurants hands to provide healthy selections for parents that are still kid-pleasing. McDonald's is kind of trying (but let's face it, not really) to lead the pack by introducing apple slices instead of french fries. Mmmmm sound's good, but I wonder how many calories are added when that same apple slice is drenched in Ronald's famous honey sauce? Sorry to bash the righteous attempt by McDonald's, but the point is that it's not a good enough start. If fast-food chains added a few more dollars to their food budget instead of to their advertising budget, maybe then would it be a healthy choice to have dinner at KFC.